David Beckham Back to Real Madrid??? Fabio Capello, manager of Spanish soccer league giant Real Madrid, has called up English soccer forward David Beckham for a match against Real Sociedad, reversing an earlier decision to sideline him, local media said on Friday. David Beckham came back in from the cold last night when Fabio Capello performed a humiliating U-turn and included him in the Real Madrid squad for the first time in a month. 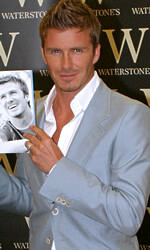 Beckham has played just once in 2007, missing six successive games. Five of those came in the wake of Capello’s vow that he would never play for the club again but he was among the 20 Madrid players who travelled to San Sebastián yesterday before their match with Real Sociedad tonight. Capello has come under increasing pressure to recall Beckham in the past 10 days. With Madrid winning just twice in six games without him, fans and team-mates have expressed their desire to see Beckham back in the side. “We don’t just want David back training with us, we want him in the team,” Guti said this week. Madrid have become aware of the damage being done to the club’s image, too. Capello last night insisted that his decision was based purely on footballing reasons and remained adamant that his authority has not been undermined by being forced into so public a climb-down. “This is not about the players saying they want him back,” Capello said. “This is purely about Beckham’s work. After he signed such a big contract with the American team, we had doubts that he would be so committed. This week he has trained perfectly. Not just good, better than good.” And, far from never playing again, Capello last night insisted that he would use Beckham for “the rest of the season”. Beckham last played for Real Madrid as a substitute in their 2-0 defeat against Deportivo La Coruña on January 7. This entry was posted on Saturday, February 10th, 2007 at 3:33 pm	and is filed under Celebrity News. You can leave a response, or trackback from your own site.